It’s all good vibes and great energy with the father and two sons who comprise high energy rock n roll band, The Bronx Wanderers. “Yo” Vinnie, sons Vinnie “the Kid” and Nickie “Styx” are backed by a six-piece band and play nightly at Bally’s Las Vegas in the Windows Showroom. Watch this fun interview with Vinnie and Vinnie the Kid. Catch some classic guitar riffs on the the Kid’s rendition of “Jingle Bells”. Even sing along with the backup singers–me and Vinnie. 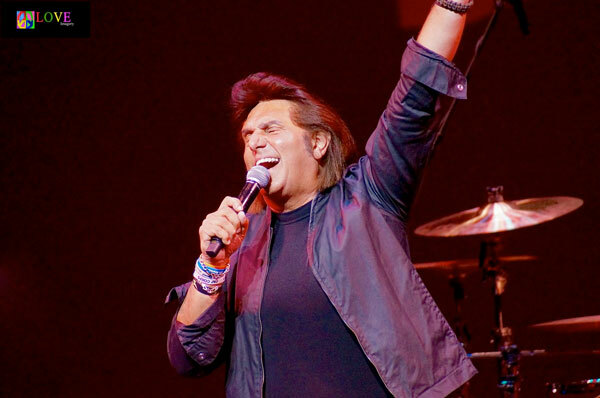 The Bronx Wanderers is a show that will rock all ages from their heads to their toes. Keg Tapping w/ The Bronx Wanderers! While every day may be Oktoberfest at Hofbräuhaus Las Vegas, the city’s most authentic Bavarian experience also offers the most fun venue in Las Vegas to celebrate the holidays this year. The beer hall offers a unique entertainment experience 365 days a year, with live bands on the stage nightly, who, in addition to traditional German/Bavarian music, will perform holiday classics throughout the month of December. And, be sure to enjoy a traditional German meal with special menus on both Christmas Eve and Christmas Day, including Glühwein, a German Christmas tradition featuring mulled wine with Christmas spices; Split Pea Soup with Frankfurter Sausage; Gebackener Tortenbrie (Brie cheese breaded and fried golden brown served with salad bouquet and cranberries) and more. The Hofbräuhaus Las Vegas is the first German/Bavarian beer hall and restaurant in Las Vegas which creates a true Bavarian beer hall experience that is even more than a dining adventure. No ordinary restaurant, Hofbräuhaus Las Vegas is an energetic party daily, with authentic German bands, boisterous sing-alongs, dancing in the aisles and on the benches, and premium Hofbräu beer. From its hand-painted ceilings and live bands to its imported beer and delicious food, Bavarian hospitality abounds. Guests can savor schnitzel, sausages, sauerbraten, pretzels and so much more. For more information or to make a reservation, contact Hofbräuhaus Las Vegas at 702.853.BEER (2337), visit HofbrauhausLasVegas.com, or find us on Facebook, Twitter or Instagram. The Bronx Wanderers celebrated their first anniversary of performing at Bally’s Las Vegas. Since opening on September 22, 2016, the most energetic show on the Las Vegas Strip has performed more than 360 shows for over 70,000 fans. Seven nights a week at 6 p.m., the trio, Vinny and his two sons – Vinny “The Kid” and Nicky “Stix” – flanked by their top-notch band, effortlessly bring to life songs from the beginning of Rock ‘N’ Roll right through today’s greatest hits. The best 90 minutes of America’s Rock ‘N’ Roll songbook on the Las Vegas Strip has attracted fans from all over the world, who flock to see the group perform hits made famous by the likes of Frankie Valli & The Four Seasons, Dion, the Beach Boys, Queen, Bruno Mars, Coldplay and many others. Celebrity fans who have been spotted at the show include the Four Seasons’ own Tommy Devito and Joe Long, Joey Dee, The Righteous Brothers’ Bill Medley, Mary Wilson of The Supremes, Jay & The Americans, the cast of Menopause The Musical including celebrity guest star “Laverne & Shirley’s” Cindy Williams, Wayne Newton, Clint Holmes, Frank Marino and the cast of Divas Las Vegas, Travis Cloer of Jersey Boys John Payne from the band Asia and more. If anything rivals The Bronx Wanderers’ passion for playing music on stage, it is their drive to help others in the Las Vegas community. Working with Win-Win Entertainment, the group has becoming actively involved with the Miracle League, a program that provides individuals with cognitive and/or physical challenges the opportunity to play baseball in a safe and nurturing environment. THE BRONX WANDERERS TAKE OVER UNLVINO! Las Vegas loves a party. And Las Vegans love to support worthy causes too. UNLVino guests were able to “take a sip for scholarship” with generous food tasting opportunities on March 30 through April 1, 2017 at the highly anticipated three night annual event in support of UNLV's William F. Harrah College of Hotel Administration. UNLVino continued its tradition of recognizing hospitality industry leaders with the Dom Pérignon Award of Excellence. Bar Rescue” star Jon Taffer, who is headquartered in Las Vegas, was honored by UNLV hospitality students during UNLVino “Take a Sip for Scholarship” event. There are three opportunities to support UNLV students and enjoy spectacular events. Returning to Paris Las Vegas’ ballroom, UNLVino’s time-honored Grand Tasting will delight guests with an unrivaled collection of premium beverages as the weekend’s main event indulges guests with delectable cuisine from UNLV’s culinary students and celebrated Vegas restaurants. Special guests The Bronx Wanderers made an appearance and absolutely killed the performance! Who knew what a little wine and some great music could do to a crowd. Dancing and hollering went way into the night. UNLVino was cofounded in 1974 by the William F. Harrah College of Hotel Administration and Southern Wine & Spirits of Nevada, the two organizations which continue to sponsor it today. Over the past four decades, UNLVino has raised several million dollars for scholarships and other academic developmental needs of UNLV students. ]UNLVino is differentiated through hands-on student experiences at all levels of event planning, execution and promotion, as well as the impactful funds raised each year – all testaments to the celebratory weekend’s broader purpose – scholarship. "If you liked Jersey Boys, you will LOVE The Bronx Wanderers!" (Sam Wagmeister, The Vegas Voice), was the first of many favorable media reviews that The Bronx Wanderers have received. After touring the country over the past 12 years, The Bronx Wanderers have found their home in Las Vegas, with more than 200 shows over the past six months under their belt at Bally's - Las Vegas. Fans and critics alike have been charmed with the best 90 minutes of America's rock 'n' roll songbook on the Las Vegas Strip. The Four Seasons' very own Tommy Devito and Joe Long became very emotional while watching The Bronx Wanderers perform some of the songs that made them famous and that eventually created the Jersey Boys phenomenon. Seven nights a week at 5:30 p.m., the trio, Vinny and his two sons — Vinny "The Kid" and Nicky "Stix" — flanked by their top-notch band, effortlessly bring to life songs from the beginning of rock 'n' roll right through today's tunes. Nearly 30,000 guests, traveling from every corner of the world, from Australia to Alaska, have enjoyed The Bronx Wanderers perform hits made famous by the likes of Frankie Valli & The Four Seasons, Dion, the Beach Boys, Queen, Bruno Mars, Coldplay and many others. To say that The Bronx Wanderers have devoted fans would be a huge understatement. Many fans return to see the show again and again, including one couple who has seen the show 36 times. Additionally, a group of fans from Chicago, who call themselves "The Front Row Ladies," have visited Las Vegas four times since the show opened, always sitting in the front row donning their Bronx Wanderers logo t-shirts. Women in particular love the group – especially Vinny "The Kid," who has received marriage proposals from women ages 18 to 88. The show has also been a magnet for some of entertainment's most iconic names including Tony Orlando, Peter Noone of Herman's Hermits, Joey Dee, Gary Lewis and Jay and the Americans. Fellow Bally's Las Vegas headliner Wayne Newton even made an appearance when he surprised Vinny in the middle of the show by pretending to be a waiter and bringing him a drink on stage, hearkening back to the days when he and Elvis played pranks on each other. If anything rivals The Bronx Wanderers' passion for playing music on stage, it is their drive to help others in the Las Vegas community. Working with Win-Win Entertainment, the group has becoming actively involved with the Miracle League, a program that provides individuals with cognitive and/or physical challenges the opportunity to play baseball in a safe and nurturing environment. "We are so proud of what The Bronx Wanderers have been able to accomplish since they opened last September," said Kathi Glist, one of the show's producers. "In addition to more than 200 successful shows, they have been embraced by the local Las Vegas community and have given back by volunteering their time to various organizations. Furthermore, they have been asked to perform for several key events in the city, including Chinese New Year at The LINQ Promenade, as well as a summit for more than 400 Caesars Entertainment executives from around the world." "The Bronx Wanderers have been a great addition to our entertainment lineup at Bally's Las Vegas," said Damian Costa, Caesars Entertainment vice president of Las Vegas entertainment operations. "They have been welcomed graciously into the Las Vegas community while notably standing out in the entertainment landscape due to their enormous talent." The games are played with soft, foam balls and foam or plastic bats, on a soft, spongy playing surface, allowing special needs individuals to enjoy physical and mental stimulation, and build greater self-esteem. Recently the Bronx Wanderers have been the kids and adults favorite people to see at the games! Opening day was on March 18th, where Vin A. and Big Vinny got to throw the opening pitch! Not only that, but they also got a special performance from Vin A. singing the song "Uptown Funk". The Miracle League of Las Vegas gives players a sense of team pride and inclusion just like their able-bodied peers that play the game of baseball. ...and Las Vegas loves The Bronx Wanderers. Vin A. visited a local elementary school to celebrate Nevada Reading Week. Comedic juggler Jeff Civillico, through his Win Win Foundation, helped place local celebs in the schools to share their talents and times with the kids. You simply visit a classroom, read a story or 2 to the children, and talk a bit about your career and field some questions if you like. It’s super fun, and very rewarding. Some other readers included: Monica Heuser of Menopause the Musical; Win Win Board Member Sue Mirman, Singer Skye Dee Miles, Vita Drew of Menopause the Musical, Win Win Founder and Chairman Jeff Civillico Pamela Carlston of St. Judes Ranch, Win Win Advisory Board Member Diahann Hall, Magician John Rotellini, Monica Direnzo of Caesars, Stephanie Arone of Activity Planners, Win Win Board Member Beth Dandy, Magician Xavier Mortimer, Natalie Shipman of Vegas Theatre Hub, Vin A. of the Bronx Wanderers Stacy Spahle of WeAre.Vegas, Win Win board president Debbie Lucas Bingham. "So happy to have been a reader for Nevada Reading Week! Went to 4 classrooms at Mountain View Elementary and read to the kids and talked about my life, working hard, and accomplishing your dreams ... A little girl even gave me her pencil because she liked me so much. Thank you WIN WIN for this opportunity!" - Vin A.
It’s a family affair when Vin Adinolfi takes the stage of Windows Showroom at Bally’s because his sons Nick on drums and Vin III on keyboards belt out the hits for Dad to sing and accompany with his rhythm. The trio who make up The Bronx Wanderers for their new show are joined by Joe Barui on sax, Joe Bonasorte on lead guitar and Jeff Saltzberg on bass guitar. Vin Sr. told me: “The band started with my two kids and myself and a few of my friends. Our original sax player was one of The Tokens (“The Lion Sleeps Tonight”) and the other was a guitar player who was an original member of The Earls (“Remember Then”). Doing up to 225 one-nighters a year took a toll on them and also took them away from their families. “My kids had their own band of friends from high school who I knew from always being in our house. The kids invited me out one night to play with them, and I asked if they wanted to tour and do this. I thought it would make for a fun dynamic. The old guy trapped with the kids and the kids stuck with the old guy. “We are together as this unit almost 4 years. In 2002, we were doing oldies shows with members of Dion’s current band at that time. In 2004, we left and went out on our own as the family act you see today.” Vin credits Dion for his start. In the show, he refers to him as the group’s patriotic saint. “I grew up in the same neighborhood as Dion and The Belmonts and Chazz Palminteri. Dion was close with our family, as my grandmother and Dion’s mother were distant cousins in the Campanella family. I know Dion since my crib. In our neighborhood even to this day, he is looked upon as our star who made it out of the neighborhood and is known worldwide. For the last five years, The Bronx Wanderers have played South Point twice a year. Vin continued: “As a record executive, I knew we would have to have a game plan, so I had a 10-year plan. I told the boys if they work hard, someday we will get our own room in Las Vegas. To do this without a hit record would mean we would have to work twice as hard as everyone else. “They agreed, and in the first five years, the plan was to play in the New York Tri-State area and establish ourselves as a serious act. I gave them a group to target and said I want to be on the level by year five. We got there in year four. The next phase was to travel across the country and establish ourselves as a national act. “We went from Seattle to Miami and from Los Angeles to Massachusetts. We roughly play 225 dates a year with the most being a sit down for only three days. So lots and lots of traveling.” For as long as he can remember, Vin’s dream had been to have his own show here: “I’m a throwback. I always say I was born too late. “I love Frank Sinatra, Dean Martin, Sammy Davis, Jr., Tom Jones, Engelbert Humperdinck, Paul Anka, Tony Orlando and Wayne Newton. I always watched and studied them. They were who I wanted to be, and Las Vegas was where they worked. Now The Bronx Wanderers are playing to packed audiences and getting standing ovations and loud cheers. Said Vin: “This is an amazing dream, and there isn’t a day that goes by where I don’t look up and say thank you for all that is happening to us. It’s an incredible opportunity in this amazing town. “I almost can’t believe it. I keep waiting to be told to wake up, that this is all some sort of dream. I keep thinking back to when I looked at the kids and we were unloading all of our band equipment on a cold winter night, and I would be looking at them as they were 14 and 11 and wondered what kind of father am I making them do this? “I never thought this would work, but I never stopped hoping and praying. I tell the kids all the time we have all of this because of the audiences who come to see us. Never forget that and each and every night, we personally thank all who come to our shows in our meet-and-greets. “Solid Gold Soul” is the other new musical at Bally’s, and we’ll take a look at that amazing tribute to Motown on Wednesday. The Bronx Wanderers came home to New Jersey and packed the house on Saturday, May 7, 2016, at the Jay and Linda Grunin Center for the Arts in Toms River, NJ. Performing to a sold-out audience of family, friends, and fans, the group wowed the hometown crowd with an exciting selection of tunes ranging all the way from the 1950s to the present. The Bronx Wanderers is a father and son (and other son!) band which includes dad Vinny on lead vocals; son Vinny Jr. on keyboards; and son Nicky on drums. Rounding out the group are friends and neighbors Joe Bonasorte on guitar, Joe Bari on sax, and Ethan Bill on bass. According to Vinny Sr., even though he grew up in the Bronx — where, over the years, he became friends with such famous local residents as Chazz Palminteri, Danny Aiello, and Tony Orlando — once he was older, he decided to cross the river and raise his family in Demarest, located in nearby Bergen County, New Jersey. In addition to that, according to Vinny Sr., he also maintains a personal connection to every song he and the boys perform in their show. As such, it’s no surprise they opened the evening at Toms River’s Grunin Center with “The Wanderer” and “I Wonder Why,” both hits by Dion, with whom Vinny Sr. used to work. In fact, according to Vinny Sr., Dion is the individual who introduced him to Columbia Records’ Tommy West and Terry Cashman, a pair of music producers who made a name for themselves producing records by such acts as Jim Croce and The Partridge Family. Telling them he wanted to be a star, West and Cashman convinced Vinny to become a record producer instead, thus enabling him to stay home in New Jersey and raise a family. He did just that — for 35 years, in fact — producing records for the likes of Alabama, Reba McEntire, George Strait, The Spinners, and many more, all while working in a local band he founded, The Bronx Wanderers. Once his sons were old enough, they joined the band, and they have now been a part of the act for years. And although the family now travels the world doing live performances — in fact, they just returned from a string of concerts in Florida and are about to embark on a recurring house gig in Vegas — they always love coming back to perform in their beloved home state. And is it any wonder why, when the audience is filled with people who know and love them? For example, at the Grunin Center, Vinny Sr. made it a point to introduce many “celebrities” in the audience — his family doctor for many years, who, he claims, up until this evening had never seen him perform; the family who owned the restaurant which gave The Wanderers their start when Vinny Jr. and Nicky were just kids; and his wife, Carol, who runs the slideshow of movies and photos during the show which visually help to tell the story of Vinny and his lifelong love affair with music. Another highlight of the show was The Wanderer’s complete rendition of Billy Joel’s “Scenes from an Italian Restaurant.” As with many of their numbers, the multi-talented band members traded off singing lead vocals and playing instruments. For example, when it was brother Nicky’s turn to sing lead vocals with Dad, brother Vinny Jr. took over the responsibility of keeping the beat by playing Nicky’s drums. Yet another highlight was the Bronx Wanderer’s medley of instrumental surf tunes which included exciting versions of “Wipe Out” and the theme from “Hawaii Five–0.” Here, Vinny Sr. turned the spotlight over to the youngsters — Joe Bari on saxophone, Joe Bonasorte on guitar, Vinny Jr. now on guitar, Ethan on bass, and Nicky on drums — and simply played the part of the “proud papa” as his “boys” rocked the house to a fascinated crowd. Following a short break, The Wanderers came back to invite the audience to sing along with them on Dion’s “Teenager in Love” and then segued into one of their most impressive performances of the night — a stunning live version of Queen’s “Bohemian Rhapsody” — so perfectly brought to life, it immediately brought the dazzled audience to its feet. For more on The Bronx Wanderers, please go to bronxwanderers.com. For more information on upcoming programming at the Jay and Linda Grunin Center for the Arts — including Broadway’s Adam Pascal and Daphne Rubin-Vega from RENT on June 3 and The 1910 Fruitgum Co. on June 4 — please go to grunincenter.org.